Harry Potter is a series of fantasy novels written by J.K. Rowling, who captured the inspiration during a train transportation and created the novel that draws the attention of millions of readers. It received warm acclaim and huge popularity among youngsters all over the world, and has become the best seller in history. Harry Potter described the student life and appealing adventures of a young wizard named Harry Potter in Hogwarts School of Witchcraft and Wizardry. The main plot is about the combat between Harry Potter and the wicked wizard Lord Voldemort, who aims to conquer all the wizards and muggles. The intense development of the plot and distinct characters of it are something you will become attached to and develop a yearning for. Thus, it is proposed that you buy Harry Potter audio book to take full advantage of it. Nowadays, the iTunes has become more and more attractive among users, and you’d better know about how to download the Harry Potter audiobooks from the iTunes store to take full advantage of them. 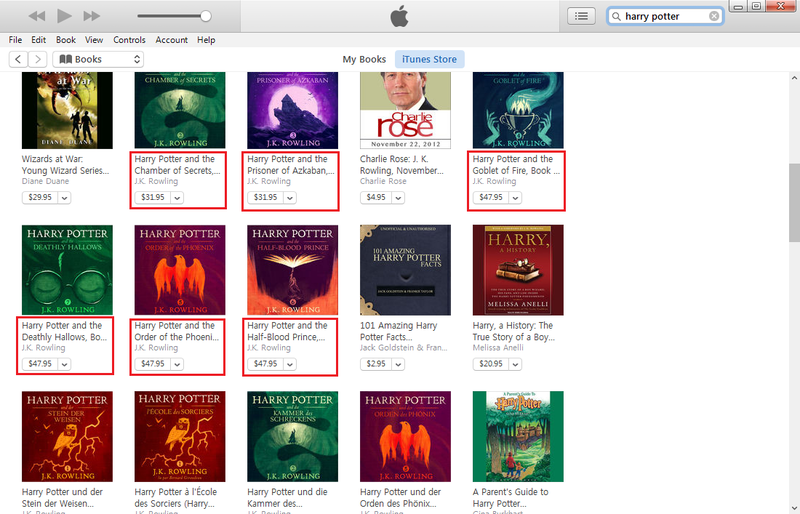 Therefore, the procedure of downloading the Harry Potter audio books from the iTunes Store is presented as follows. Step 2. Enter the Apple ID and password when prompted, and then click on the Sign In tab. Step 3. Open the pull-down list on the sub-menu bar, and select Audiobooks. Step 4. 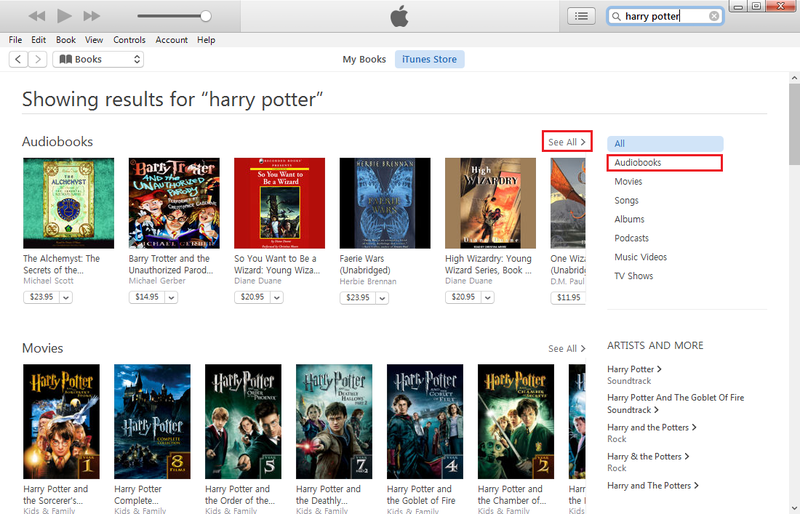 Search Harry Potter in the iTunes Store. And when the results come out, click See All on the right side of the Audiobooks label or Audiobooks under All in the right column. Step 5. Scroll down and you would see a lot of Harry Potter audiobooks labelled J.K.Rowling and those are the audiobooks you are looking for. Click one of them to enter the page with detailed information about the audiobook. You would see that the narrator of the Harry Potter audio book series is Jim Dale. Step 6. Click the Buy Audiobook button to purchase and download the audiobook to your computer. The DRM protection which is appended to iTunes audiobooks prevents the users making full use of them, as a result, the Harry Potter audiobook narrated by jim dale purchased from iTunes store can only be downloaded to your own iOS devices for backup. Thus, it’s quite annoying if you only have Android phones or tablets and want to play the Harry Potter audiobooks on them. The solution to the problem is to remove the DRM from the Harry Potter audiobook collection using Leawo TunesCopy Ultimate. The Leawo TunesCopy Ultimate could remove the DRM protection from the iTunes M4B audiobook and Audible AA/AAX audiobook directly and convert the M4B, AA, or AAX files to MP3 files for playback on mobile handsets with high quality. Read the procedure carefully and patiently to get to understand how to remove DRM from iTunes audiobooks without problems. Launch the TunesCopy program, and click on Add Files button in the middle of the sub-menu bar. 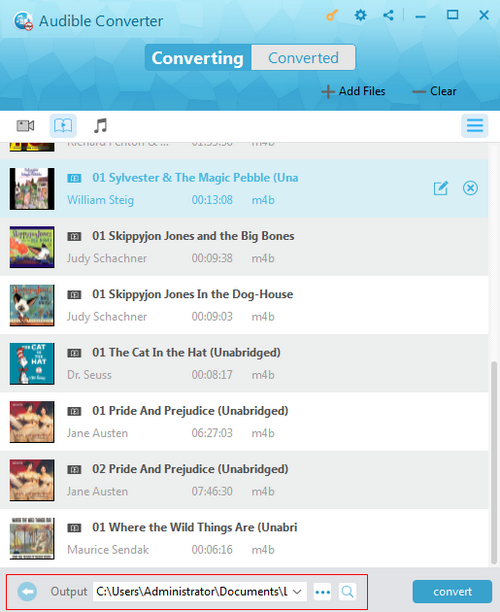 Click on Audio books just below Library in the pop-up Add Files panel and choose the Harry Potter audiobook set files from the right panel to be imported into TunesCopy Ultimate. Then click on Add to start the importing process. If you want to remove an audiobook file from the list, just choose the file and click on the remove button. Also, all the audiobook files will be removed completely if you click on Clear button on the sub-menu bar. Furthermore, the TunesCopy Ultimate enables you to edit the audiobook file. Choose an audiobook file in the list and click on Edit button, then choose the Channels, Sampling Rates and Bit Rates you appreciate. The output MP3 file will be saved with the chosen Channels, Sampling Rates and Bit Rates after removing the DRM protection. Click on “…” button at the bottom of the interface and choose the appropriate output directory for keeping the output MP3 file after conversion. 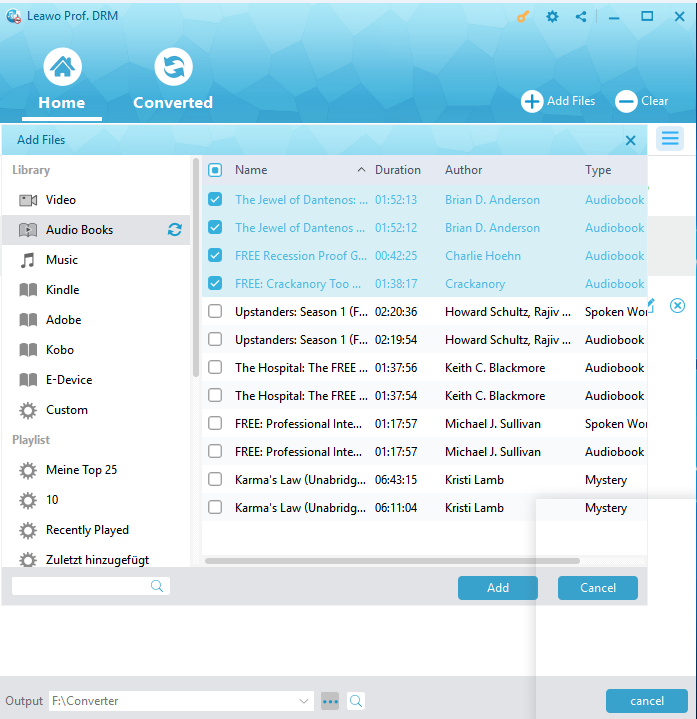 Click on the Convert button in the lower right corner of the interface to start removing DRM from audiobook files. You have to type the Apple ID and password when prompted in order to authorize your computer for playing the iTunes audiobook before the conversion process starts. After removing DRM from iTunes audiobook files, the Harry Potter audiobook files will be converted to MP3 files without losing any original quality. The converted tab will be marked with a red dot after the conversion process. Click on Converted tab to navigate to the interface which presents all the output MP3 files. Click on the Open file option at the end of the target file if you want to open the output MP3 file immediately. Also, you can find the output file conveniently through the quick search column at the bottom of the interface. 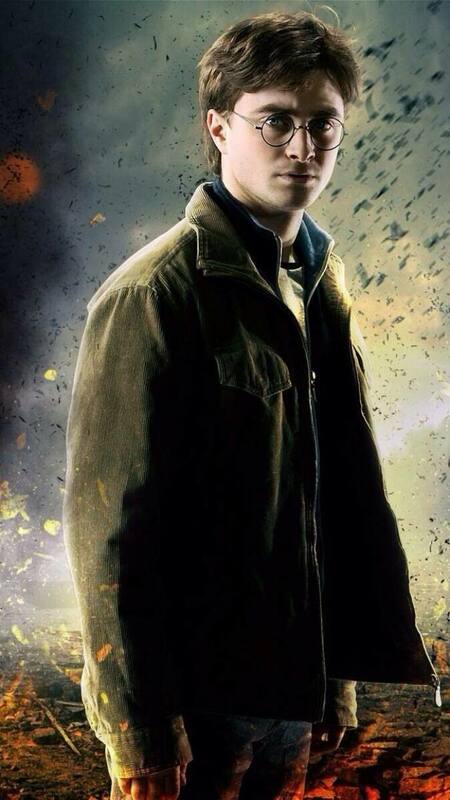 Harry Potter is a series of fantasy novels that received warm acclaim and captured the minds of millions of readers. 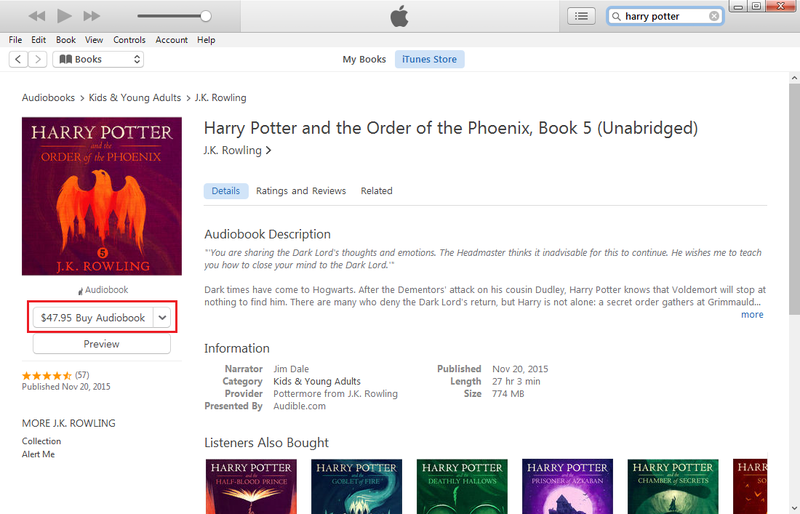 The iTunes allows you to download Harry Potter audio books to your computer and enjoy them conveniently. The DRM protection which is appended to iTunes audiobooks prevents the users making full use of them, therefore, you need to know how to remove the DRM from iTunes audiobooks. The procedures of downloading the Harry Potter audio books from the iTunes store and removing DRM from them using Leawo TunesCopy Ultimate are articulated clearly in the article. If you follow these steps carefully and patiently, you could enjoy the iTunes audiobooks on Android or other mobile devices anytime you want.